FLORIDA is a band with a unique sound. “Good time jazz meets English country” "… Chicago, New York, Big Band and even Phil Spector meet ceilidh dance tunes.” The fusion of swing, jazz, traditional folk, folk rock, and much else besides, has become a distinctive trademark. Nobody plays English dance like Florida. The 5 man line-up delivers “Towering brass and sax texturing over serpentine yet crisp electric guitar and solid melodeon base, driven on by pulsing bass lines”. After 20 years playing the British folk and festival circuit, Florida is still “essential listening to anyone with an interest in what can be done with UK traditional dance music” and “happy music, the sort that can put a smile on your face … from one of the most popular dance bands on the circuit”. (Quotes from Barry Callaghan and Living Tradition). It was more than 20 years ago that FLORIDA launched upon the unsuspecting English folk dance public the unique fusion of swing / jazz / trad folk / folk rock which now has fans the length and breadth of the country, and beyond. 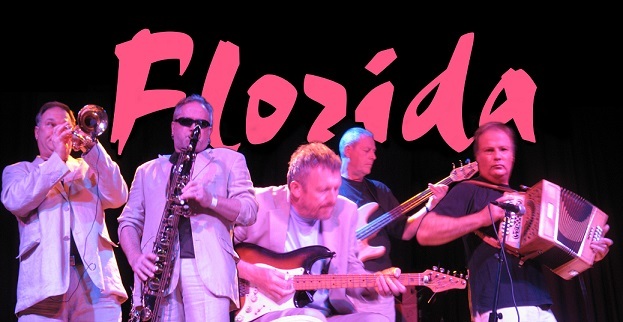 FLORIDA's sound is unique : a brassy collision of traditional English country dance and good time jazz, underpinned by muscular dance rhythms, generating hair-raising harmonies from a melting pot of roots and rock influences. The tunes are mainly English, but the band also draws on other European traditions and the compositions of fiddler/guitarist Gavin Atkin. With a line-up including fiddle, electric guitars, horns and melodeon, the band's signature is a mix of woodwind and brass alongside the fiddle and accordeon, and harmonised melodic instruments over a driving dance beat established by bass and electric guitar. With this mix, drums are unnecessary. FLORIDA is : Gavin Atkin (fiddle, guitars, vocals). Tim Bull (melodeons, vocals). Richard Goodwin (soprano, tenor and baritone saxes, taragot, wind synth, etcetera). Charlie Handley (trumpet, trumpet synth, vocals). Chris Warner (bass, vocals). The band's musical background covers classical, jazz, rock, trad folk, dance bands, a capella harmony, and ritual dance. It shows.